The 2017 World AIDS Day Vigil at St. Philip’s Church in New Hope was an evening of song, prayer, remembrance and unity. On behalf of FACT-Bucks County, thanks are extended to our partner, New Hope Celebrates, Rev. Michael Ruk, St. Philip’s Church and the local community for coming together to remind us that HIV/AIDS has not gone away. There is still a need to raise money, increase awareness, fight prejudice and improve education. We are grateful to have been given the opportunity with hope and inspiration to work continuously together in the fight against HIV/AIDS. World AIDS Day is held on December 1st each year and is an opportunity for people worldwide to unite in the fight against HIV, show their support for people living with HIV and to commemorate people who have died. St. Philip’s Episcopal Church, along with the neighboring communities including Bucks, Mercer and Hunterdon counties, will remember World AIDS Day with an annual vigil to those who have died from HIV/AIDS and to provide continued support to those living with the disease. 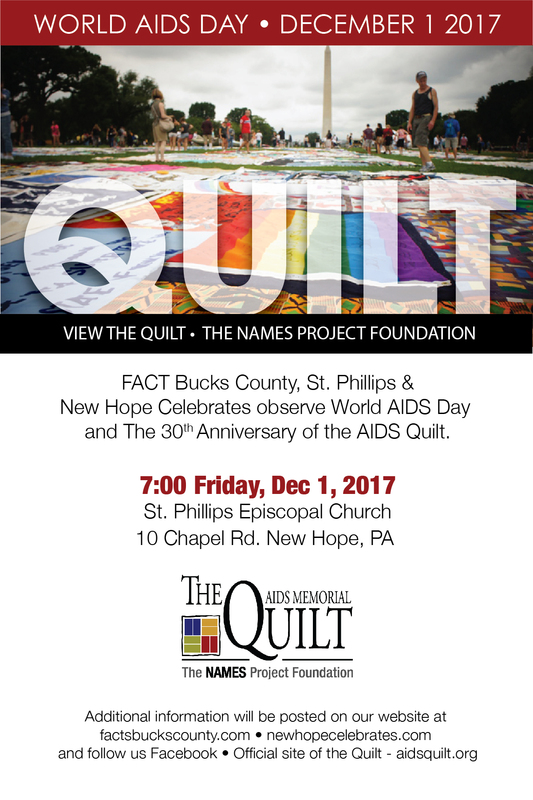 This year sections of the internationally celebrated AIDS Memorial Quilt- the 54½ ton, handmade tapestry that stands as a memorial to more than 96,000 individuals lost to AIDS- will be on view at St. Philip’s Episcopal Church, 10 Chapel Rd, New Hope, PA on Friday December 1st beginning at 7:00 PM. Established in 1987, The Names Project Foundation, the international caretaker of the Quilt, works to preserve, care for and use the AIDS Memorial Quilt to foster healing, advance social justice and inspire action. Sections of the Quilt are continuously on display in houses of worship, schools and community centers all in the hope of making the realities of HIV and AIDS real, human and immediate. To date, more than 18 million people have seen the AIDS Memorial Quilt at tens of thousands of displays throughout the world. The idea for the AIDS Memorial Quilt was conceived in 1985 by AIDS activist Cleve Jones with a single 3 X 6 foot panel and has evolved into an epic tapestry of hope and love to include more than 49, 000 panels. The panels come from every state in the nation created by friends, lovers and family members in an attempt to transform loss and heartbreak into hope and healing. We thanks St. Philip’s Church for their visionary efforts in hosting this event and invite you the public to see what wonderful healing art has been created as a memorial and celebration of the lives of the people lost to the AIDS epidemic in a war against a disease that has no cure. New Hope Celebrates, Bucks County Dept. of Health and St. Philip’s Episcopal Church. FACT-Bucks County is bringing 4 sections of the AIDS Memorial Quilt to our area from October through December. It will be exhibited at FACT-related events which will include: October 4th Bingo, Pumpkin Ball – October 14th, World AIDS Day December 1st, and Holiday Bingo, December 6th. As part of the Quilt display there will also be a signature square at each event so that visitors can express their feelings about the Quilt, HIV and AIDS during the exhibit. FACT-Bucks County is proud to have been chosen to have the AIDS Memorial Quilt as part of our continuing outreach and education program. 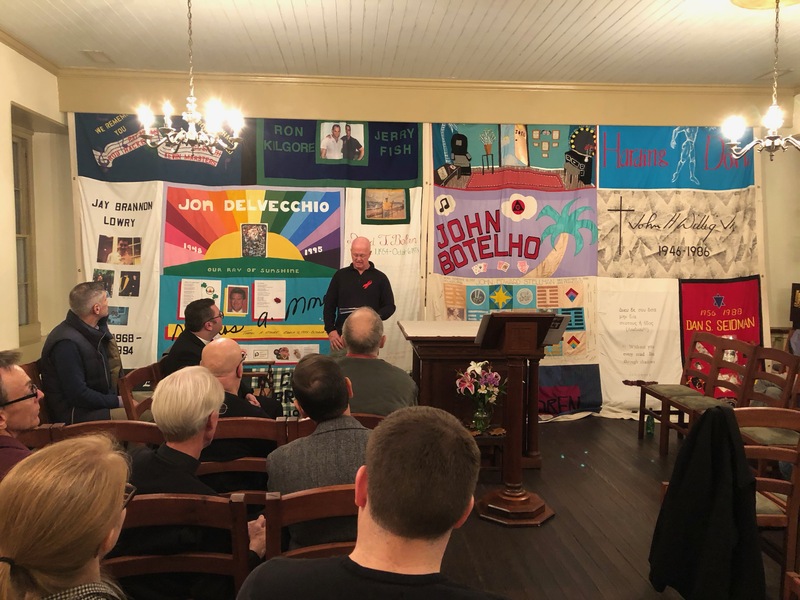 The Quilt was conceived by gay rights activist, Cleve Jones, in 1985 and the first panel was made in memorium of a friend who had passed from AIDS. That same year the Names Project Foundation was organized to oversee and catalog the many panels that were being produced and sent to the Names Project to memorialize loved ones who have passed from the disease. Currently there are over 50,000 individual panels representing over 90,000 individuals in the current warehouse in Atlanta Georgia.